Russia has surprised markets for the second year in a row with wheat supplies and exports topping expectations. But recent gains in Russian wheat prices suggest the country might finally be giving up its competitive dominance. 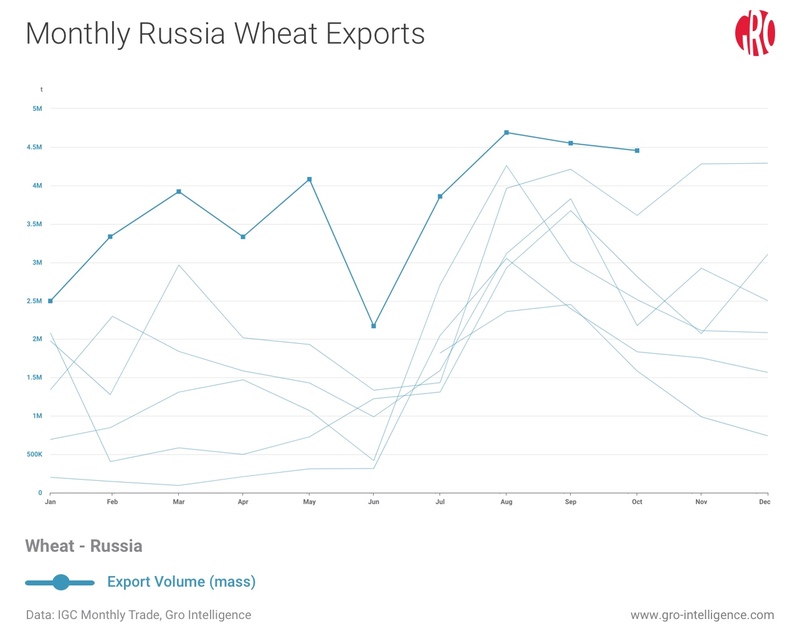 Wheat exports from Russia have been on a tear. Exports maintained a record pace for each of the first six months of the current marketing year, which began in July. That followed huge supply and better-than-expected export capacity in 2017/18. 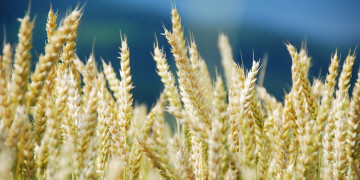 The country’s abundance has kept a lid on world wheat prices, and led to a steep buildup of US wheat stocks, which were priced out of the market. Traders kept wondering when the Russian juggernaut would finally slow down. Russia briefly lost its status as the world’s cheapest origin, missing out on a December round of purchases by Egypt’s General Authority for Supply Commodities (GASC), the world’s largest importer of wheat. Wheat from Ukraine and Romania underpriced Russian supplies and it was the first time since August that no Russian wheat was purchased. The most recent round of GASC purchases on Jan. 9 returned to Russian origin, so the competition looks to continue for a while longer. 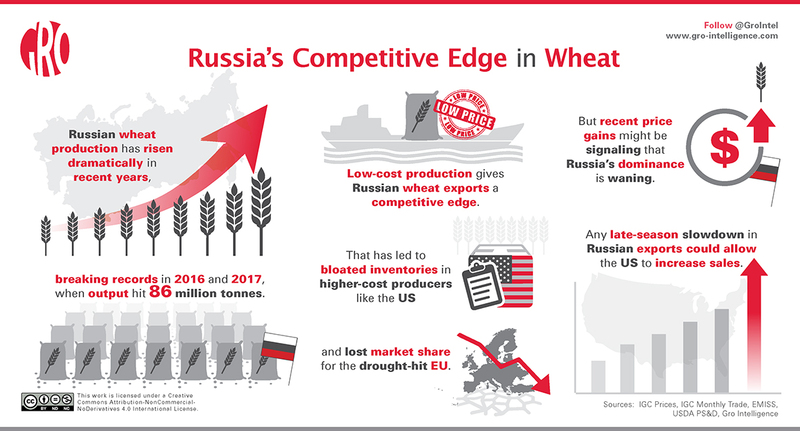 In this Weekly Insight, we assess Russia’s impact on wheat markets in recent history and how the country’s fast-expanding role will influence global grain trade flows in the future. Black Sea wheat already dominates Asia destinations and Russia is now trying to expand its market share in North Africa. Since the devastating 2012 drought, Russian wheat production steadily rose. 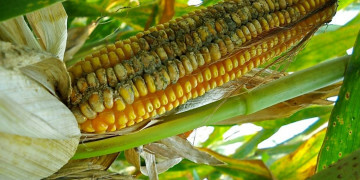 It culminated in a massive 85.9 million tonnes 2017 crop, which shattered the previous record of 73.3 million tonnes from the prior year, as favorable weather boosted yields. This past crop experienced closer to normal weather, which resulted in a still impressive 72.1 million tonnes. Big increases in fertilizer use also have accelerated recent years’ yield gains. Leading fertilizer manufacturers are working closely with farmers to improve practices and facilitate a Russian farming renaissance. Fertilizer use on grain crops increased 25 percent from 2014 to 2017. Russia typically exports 75-80 percent of its fertilizer, resulting in domestic prices being linked to world prices. Following a large ruble devaluation in 2014, farmers campaigned for a break and producers agreed to provide a 10-15 percent discount on export prices for the domestic market. Rates of fertilizer application are expected to continue to increase to boost production as expansion of arable land is limited by climate and geographic challenges. Increased investment in farming practices and normal to above-average weather contributed to the three largest crops on record. Despite the massive 2017 crop, analysts and traders predicted that logistics, both transport from the interior of the country to the ports and loading capacity at the ports, would limit Russian exports to around 33 million tonnes. As the July-June marketing year rolled on it became clear that forecast was far too conservative. Monthly exports were a record from September 2017 on. The May 2018 exports of 4.1 million tonnes were more than double the previous record. The season finished up with a whopping total of 41.4 million tonnes of exports. On top of ample supply, the ruble’s weakness allowed Russian farmers to keep prices competitive on the world market while collecting solid profits. This facilitated the movement of grain from the interior, which added to supplies from regions near the Black Sea that typically harvest mainly for export. As a result, US exports were held in check despite having record stocks on hand. The global supply picture coming into the 2018/19 marketing year, which began in July, was significantly different. Russian production returned to trend yield, EU production suffered from poor weather and Australia was hit by a severe drought. On paper it looked like Russia had exhausted its excess stocks from the previous crop and that a smaller 2018/19 crop would result in less export availability. Instead, Russian exports started the new marketing year at a blistering pace, reaching new records in each of the first four months. Exports from July through December totaled 24 million tonnes. The fast pace of exports led some in the market to assume it would only hasten the seasonal slowdown of shipments. Rumors that the Russian government might intervene to limit exports to 25-30 million tonnes for the year in order to maintain domestic supply have circulated since September. However, the Ministry of Agriculture recently maintained a stable outlook on the market and said there was no need for export controls. Private estimates for final exports are now in the range of 35-37 million tonnes. Once again Russia has outperformed expectations and prevented a rally in world wheat prices. Monthly exports set a record each month from September 2017 through October 2018. Russian prices of wheat for export are rising, but hardly at a pace to signal a shortage of supply. Traders continue to anticipate Russian exports tapering off and resulting in higher export prices that would allow other origins to take a larger share of global exports. Russian prices on a free-on-board (FOB) basis rose above those of US hard red wheat, but Russia still has a significant freight advantage to many key destinations (witness the latest state purchase by Egypt’s GASC on Jan. 9 that was exclusively supplied by Russia). Russia also plans to subsidize railway transportation from distant regions between February and September to cap prices. Exports are seasonally slow at this point of the year due to winter weather, so it remains to be seen when supplies will get truly tight. The pace of EU shipments is falling further behind last year and Australia suffered another drought. The US should have a window later in the current season for sales to pick up, but the pace to this point was slow enough for the USDA to cut its forecast for US exports for the current marketing year by 25 million bushels in the December WASDE report. Based on its own pace model, Gro Intelligence reduced the US wheat export forecast by an additional 25 million bushels, to 975 million, in the Gro Supply & Demand report released Jan. 11. Russian FOB prices were cheaper than the those of the US and EU for the first half of the 2018/19 marketing year, which began in July. Prices currently remain virtually even among the three origins. Russian wheat export prices have slowly ticked higher in recent weeks and offers for shipments in February, March, and April indicate that prices will continue to rise. But it remains unclear if global supplies will get tight enough to satisfy those market participants betting on a big price increase. By the time it becomes difficult to find physical cargoes, the futures market price may be reflecting more concern about spring weather and the health of the next crop. 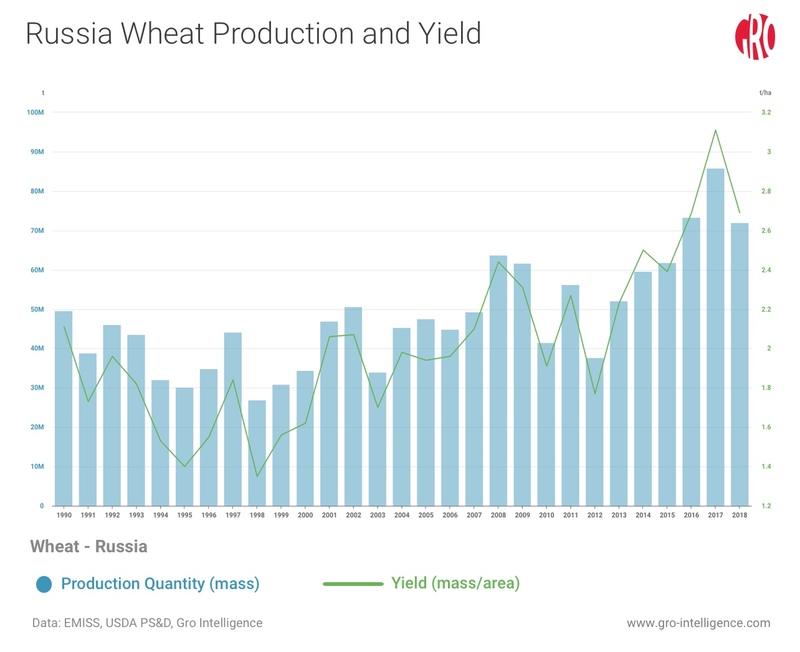 Russia and Ukraine expanded their winter wheat planting area by about 2 percent, the largest producing countries in the EU expanded area by 3.5-5 percent, Argentina is finishing up harvesting a record crop, and the US will still have historically large stocks. 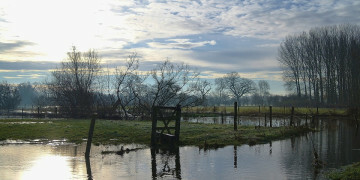 If physical supply is hard to find in the April to June period, buyers may choose to wait until the next crop is harvested instead of paying up. 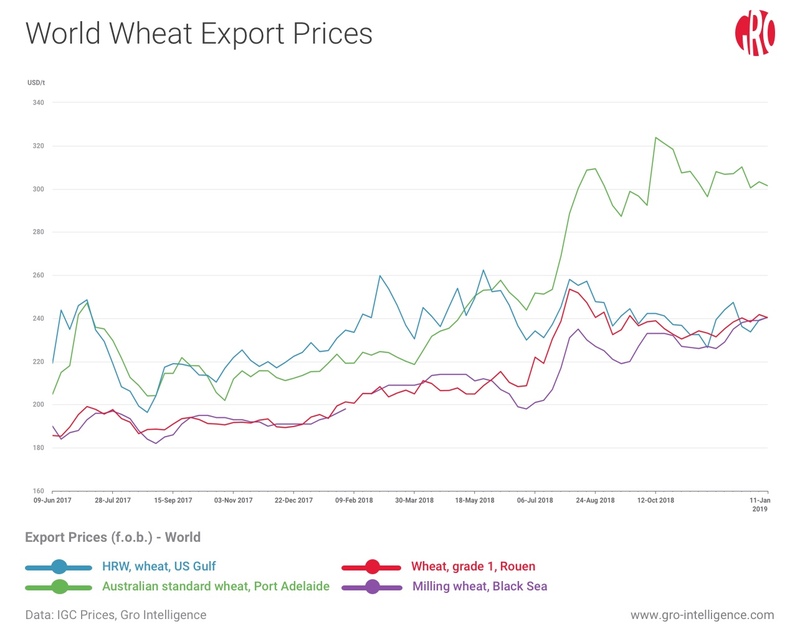 At the beginning of the 2018/19 season, the global wheat picture looked like it was headed for the tightest stocks-to-use ratio among major exporters in several years, which would typically result in a much higher price. Global wheat supplies were depressed because of droughts in the EU and Australia, and Russian supplies were believed to be limited due to the massive export program in 2017/18. But now, at the halfway point of the season, prices instead appear to be following a similar path to 2017/18, with surprisingly large Russian supplies preventing prices from rising much and frustrating bullish expectations.